Founded in 1860, Augustana boasts more than 150 years of experience educating top students in the region and world. The university offers a 4-year bachleor of arts degree in over 100 majors, minors and pre-professional programs. View our course catalog to find course descriptions, major and minor requirements, and general education requirements. Augustana's 136 full-time professors value teaching undergraduate students and are engaged in important research. In addition to teaching, they serve as mentors and advisors to students. Our professors have earned Ph.D. degrees from Harvard, Notre Dame, Penn State, the University of Michigan, the University of Minnesota and many more notable doctoral-granting institutions. Completing a liberal arts curriculum consisting of many courses outside their major or minor area(s) of study, students at Augustana develop a well-rounded background to draw upon after graduation. 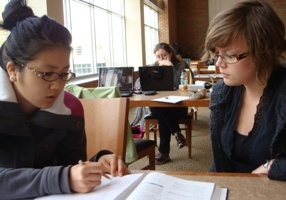 Graduates from liberal arts colleges can communicate effectively orally and in writing, think critically, adapt easily to new technology and changing work environments, and are able to make connections between seemingly disparate fields—skills that are applicable in and transferrable to any profession. In the words of Augustana's Dr. Eric Wells, "An engineer that can design a highway overpass is valuable. But an engineer who can also effectively explain to the city council why the off-ramp needs to look the way it does is a valuable person to have around." Augustana follows a "4-1-4" academic calendar (.pdf), meaning that students have a 15-week "Fall Semester" (September-December), followed by a four-week "Interim Semester" (January), followed by a 15-week "Spring Semester" (February-May), with breaks in between.